The Flight Deck Veterans Group has partnered with Edwardsville Township in Illinois to restore a United States Navy A-7E Corsair. The aircraft is currently on display at the Robert C. Stille Edwardsville Township Community Park. Edwardsville Township Supervisor Frank Miles announced the board’s approval of the contract with Navy veteran’s group. They are a Tennessee-based national non-profit organization that restores aircraft as part of their mission of serving veterans and preserving the legacy of flight deck operations. The township has worked with the Flight Deck Veterans Group to determine the A7E Corsair’s period of service. “We have learned that our aircraft took her maiden voyage in 1975 off the flight deck of the USS Nimitz as part of VFA-82 Marauders,” said Miles. As number 303, she was stationed there until 1980. In 1982, the aircraft served on the USS John F. Kennedy and then the USS Saratoga from 1984 to 1996 with deployments in the Mediterranean Sea. 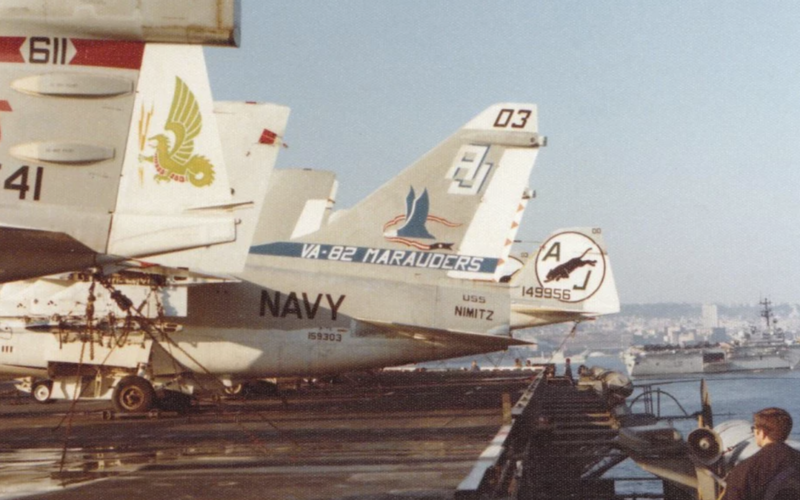 “We’ve asked the Flight Deck Veterans Group to restore this historic plane to the period of its maiden voyage on board the USS Nimitz in 1975 and give her back a piece of her identity as a Marauder,” said Miles. The Flight Deck Veterans Group will muster as many former members of VFA-82 Marauders, the A-7 Organization, and other flight deck veterans who served on board the USS Nimitz. “We want as many like-minded veterans to participate who have this plane in common and allow them to take part in preserving a very important part of aviation history,” said Jared Ashley, CEO and Founder of the Fight Deck Veterans Group. “The Flight Deck Veterans Group is excited to help the community bring this historic aircraft to life and honored to be a part of this project,” said Ashley. The veteran’s group has restored historic aircraft across the country, including an F-14 Tomcat on display at the historic USS Yorktown in Charleston, SC and Fast Eagle 102, the first F-14 Tomcat to shoot down another aircraft in combat. The latter is on display at the Commemorative Air Force’s High Sky Wing in Midland, Texas.